Quarterback Derek Carr poses for pictures at The Oakland Raiders media day, Monday, June 11, 2018, at the Oakland Raiders Practice Facility in Alameda, California. Running back Marshawn Lynch poses for pictures at The Oakland Raiders media day, Monday, June 11, 2018, at the Oakland Raiders Practice Facility in Alameda, California. 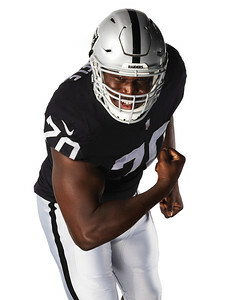 Offensive lineman Kelechi Osemele poses for pictures at The Oakland Raiders media day, Monday, June 11, 2018, at the Oakland Raiders Practice Facility in Alameda, California. Tackle Kolton Miller poses for pictures at The Oakland Raiders media day, Monday, June 11, 2018, at the Oakland Raiders Practice Facility in Alameda, California. Fullback Keith Smith poses for pictures at The Oakland Raiders media day, Monday, June 11, 2018, at the Oakland Raiders Practice Facility in Alameda, California. Punter Johnny Townsend poses for pictures at The Oakland Raiders media day, Monday, June 11, 2018, at the Oakland Raiders Practice Facility in Alameda, California. Defensive end Arden Key poses for pictures at The Oakland Raiders media day, Monday, June 11, 2018, at the Oakland Raiders Practice Facility in Alameda, California.